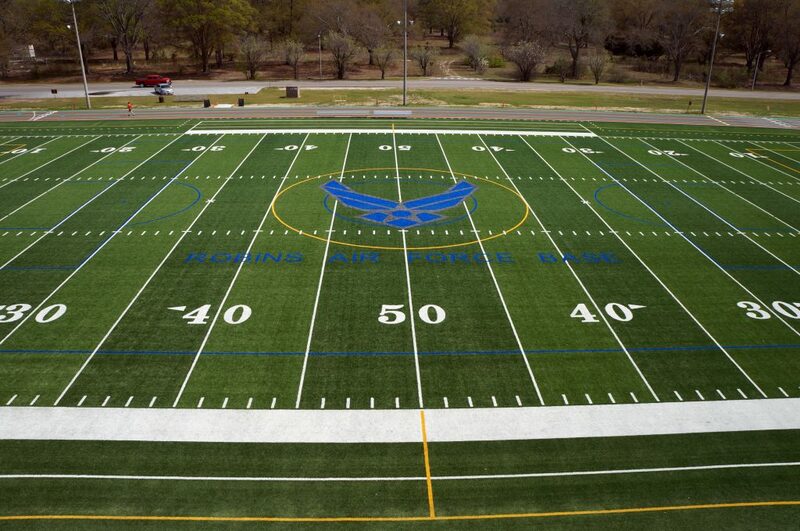 As part of Patriot Comm, Futron’s Joint-Venture with a Service-Disabled, Veteran-Owned Small Business, we were awarded a Bid-Build project at Robins Air Force Base to update the athletic track. Through our performance on the Robins Basewide Operational Program Execution Construction (BOPEC) contract, Patriot Comm demolished the existing athletic track and constructed a new track to update the sports field and minimize erosion. Our Construction Division led the creation of an asphalt, quarter-mile oval track with rubber track surface to replace the existing natural grass track. We also updated the track infield with synthetic turf and a long jump pit and asphalt and rubber surface runway. We also applied custom, multi-colored lettering in the middle of the field. Our team laid new drainage pipe and inlets as part of the erosion control plan, and filed weekly erosion control inspections with the State of Georgia to ensure high-quality work that met the rigorous standards. The project was completed on-time and on-budget to meet high quality standards. Click here for more information about Futron’s Design-Build Construction Practice.